Click the green button at the top or on the photo to the right. 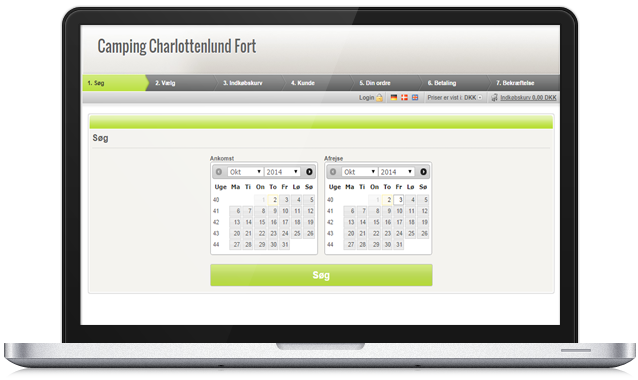 Select the desired start and end dates of your stay. Select the camping form. This opens a map of the campsite where you can choose between available pitches. Click on the desired pitch and click on 'book'. Specify the number of adults and children who will be staying at the pitch during the stay. Click 'Continue'. Fill in name, address and contact information, and read and accept the terms and conditions. . Click 'Continue'. Read your booking carefully to ensure it is correct. Please state whether you want to pay the full amount of your stay immediately, or merely a deposit of DKK 200. The deposit is offset against your total payment on departure. Click 'Continue to Pay'. Specify which payment card you want to use for payment. Enter your account information and click 'Pay Now'. You will now receive your payment confirmation. A copy is also sent to the email address you have specified in Section 4.